“There are more opportunities in Britain”, says Gulaid, a Norwegian-Somali barber shop owner from Streatham. The land of opportunity? You might be forgiven for raising an eyebrow or two with unemployment high and with the threat of a triple-dip recession looming. It seems surprising that Britain is still a draw for some. Gulaid has not come with a rose-tinted view of our green and pleasant land. He came because he thought that in Britain he could achieve his ambition to start his own business. Something he felt unable to do in Norway. He took a risk and left his adopted home, where he’d lived for over a decade. Behind him he left an oil-rich land with an economy growing at 3.5% a year. With 3.2% unemployment and some of the highest wages in the world. It is also home to one of Europe’s most generous welfare states. He arrived first in Bristol before moving to London in 2012. His ambition quickly became a reality. His shop is sandwiched amongst the internet cafes, Western Union signs, ads for calling cards, and the bustling cafes on this busy stretch of Streatham. I visit on a cold dreary Sunday before Christmas. I ask Gulaid for a high-top fade haircut. He looks at me bemused. I ask if he’s watched The Fresh Prince of Bel Air. He nods in hesitant agreement and responds “yes”. Uncertain I say “I want that Will Smith haircut”. He nods again. Still unsure, I decide to plonk myself down on a chair and wait my turn for my cut. Sat in the corner of this tiny, hastily pieced together room is Gulaid’s friend. He is drinking Fanta and chewing khat out of a blue plastic bag. 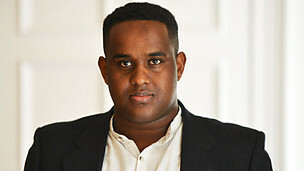 He is another of Europe’s African citizens who call Britain home. He left Belgium after more than 15 years as a resident for one reason: he wanted to make money. He hopes to achieve his ambition by becoming a London taxi driver. “For a few weeks now”, says Gulaid when asked how long his shop has been open for. He goes on to tell me eagerly of his plans to renovate and update. He is buzzing with ideas and has many plans for the future. His work ethic is impressive, alongside running his business he works as a bus driver for a special needs school. Gulaid undermines popular myths about immigrants. Despite coming with little to his name, he has realised his ambition. It’s not hard to see why he chose to set up shop in Streatham. Here he can tap into established business and social networks and he has a ready supply of potential customers on his doorstep. Is Gulaid right? Is Britain a land of opportunity? Ne Kunda Nbala[i], a young Congolese filmmaker who once lived in France, now based in the UK, agrees with him. He says the Congolese in France and Belgium flock to Britain “because of better job opportunities, especially in London”. This phenomenon is not unique to Congolese and Somalis, other Africans across Europe arrive in increasing numbers, German Nigerians or Italian Ghanaians, there is perhaps a collective feeling that Britain is the place to “˜make it’. The BBC series, In Search of the British Dream, aimed to see Britain through the eyes of the foreigners who have settled here since 2001. Research carried out for the series by the Oxford University Migration Observatory, showed that 141,000 or 7% of those who come to Britain under EU rules were born outside the continent. A sizable proportion of this figure is likely to consist of Africans; we don’t yet have reliable estimates for say the number of Italian Ghanaians or French Congolese. But, we do know that Somalis are likely to make up the biggest proportion of Africans. 20,000 have come from the Netherlands, about a third of all Dutch Somalis. Smaller numbers have come from Nordic countries, with 4,000 from Denmark. The 2011 census showed the Black African population is one of the fastest growing ethnic groups in Britain. The population doubled in 10 years and there are now 989,628 Black Africans, constituting the dominant Black group. Third country migration has emerged as key feature of African population movements within Europe. No longer just colonial, Africans now come from every corner of the continent. Britain is a destination hotspot. We don’t see significant numbers of English-speaking Africans heading to France, Belgium or Portugal. But, we are seeing a significant reverse trend of Francophone and Lusophone Africans coming here. Britain, above all London, remains the magnet for Africans, whether you’re a Dutch Somali or a Tunisian marooned on a Greek Island on Europe’s doorstep. Opportunities are the primary pull, but so is the English language, education and Britain’s place as a hub for established successful African diaspora communities, especially in London. These communities attract aspiring African immigrants who want to be better connected to emerging markets across the continent. If you can run a successful business in Britain, then you are in a stronger position to do the same back home. Africa’s largest money transfer business is operated out of London, a number of telecommunications and airline companies also have roots here. Once in Britain they often find a bigger pool of co-ethnics with access to networks which help finance their business dreams. They can access communal and informal loans systems away from the inhospitable mainstream banks, and pool their resources together. This often means starting small, from a fruit stall outside a corner shop, to establishing a joint-owned internet café that serves a number of business functions. Asians went from being small business owners and shop keepers, to their children, and grandchildren being a significant part of the professions (doctors, dentists etc). Today there are 50,000 Asian businesses across Britain and together they contribute £60bn nationwide. Their success shows it’s possible to move up the social and economic ladder through entrepreneurialism, and it’s this example Africans hope to follow. This might explain what drove Gulaid to leave the relative comfort of Norway for Britain. Perhaps coming to Britain in the short-term might mean taking a loss, but in the long term Gulaid has a good chance of running a successful business and climbing up the ladder. Ugandan Asians are a particular source of inspiration. The majority of them are Gujarati’s who moved on the conveyer belt of Empire in the early1900s. Many worked as small business owners, and formed a distinct mercantile class before they were forced out by Idil Amin in 1972; their land, property and wealth seized. They came to Britain with little beyond English and a basic education and went on to become one of the great success stories of post-colonial immigration. A recent poll for the think-tank British Future found that immigration is regarded by the public as the biggest issue facing British society. But these concerns do not apparently impede a desire for Europe’s Africans to come here. This is perhaps because third country migration is done out of choice with an eye on the long term. “People are tolerant and less racists”, says Ne Kunda Nbala. A key reason he feels the Congolese leave France and Belgium for Britain. This again is about the legacy of post-colonial immigration. Racial struggles of the 1960s and 1970s in places like Southall and Brixton led to the modern framework on race and equalities we have today. Now ethnic faces appear on TV, we have ethnic MPs, representation in the professions and attitudes in wider society have shifted remarkably. It is clear that Europe’s Africans consider Britain to be a less racist place. And this isn’t just first-generation African immigrants. Second and third generation Africans in Europe, especially French North Africans, consider us more tolerant. Many have left France in recent years, which is uncompromising in its default assimilationist position, and militantly committed to its secular principles. Under its egalitarian ethos, which views citizens as equal, the French state does not permit the collection of data based on ethnicity. In stark contrast Britain has done this for decades. In France today somebody called Mohamed, Suleiman or Mustafa is four times more likely to be unemployed than somebody named John or Philippe. Making a secondary move across Europe comes with benefits. Britain attracts the most aspiring Africans like Gulaid, who out of choice make their home here. This current wave is reminiscent of those Gujaratis who left India in the early 1900s becoming shop owners and merchants in Kampala and Nairobi. A lasting impression Gulaid leaves with me is his optimism about his future in Britain. His determined gritty can-do attitude should inspire us all. In these tough economic times, it should give us hope at least that some still see Britain as place where you can make it.